Established in 2012, Casumo is a betting site that is registered in Malta. It boasts that it has earned titles from the EGR Awards for Mobile Operator in 2017 and In-House Innovation and Mobile Operator in 2018. The gaming portal hosts a wide range of games that can be accessed on desktop, tablet, and mobile devices. It also promises you secured payments, fulfilling promotions, and fast multilingual support. But did Casumo live up to its promises? Find out in this in-depth review. The moment you sign up with Casumo, you are eligible for this welcome gift. 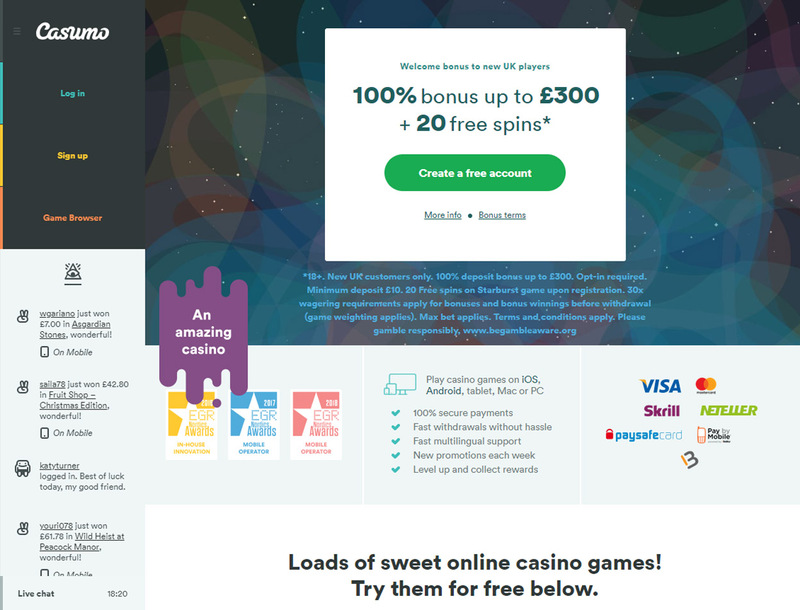 You can get a 100% bonus up to £300 with 20 free spins. All you need to do is deposit at least £10 in your account. Should you decide to withdraw this deal, you must wager the deposit amount 30 times. Casumo gives you a chance to win free spins every 30 minutes with Reel Races. It is a Video Slots tournament that happens every day from 0:00 to 23:30 for about 20 to 50 minutes. To join, you must opt-in for each race before the tournament starts. The betting site will provide you with the list of qualifying games. A win will guarantee you two points. A big win will give you 20 points. Three wins in a row will reward you 5 points. Two big wins are equivalent to 35 points. One Mega Win will award you 100 points. The player with the highest point will receive 100 free spins, second place will get 50 free spins, third place will win 25 free spins, and fourth, as well as the fifth place, will get 10 free spins. Once you become a member of this betting site, you will see a progress bar in your account. Each time you play, the bar increases and you level up. For every level that you get, you have a chance to win exciting rewards from the gaming site such as bonus spins, cash prizes, and deposit bonuses. Take note that each bonus has a corresponding wagering requirement. 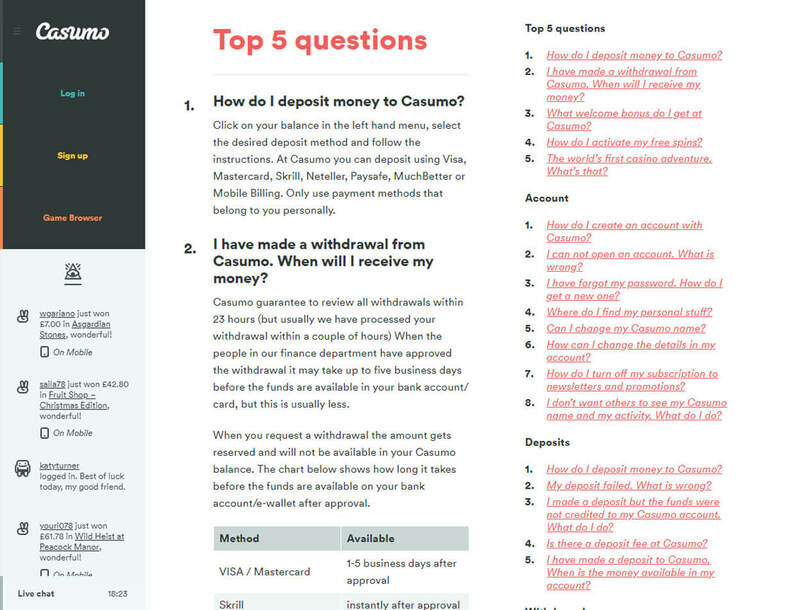 Casumo does not state the requirement for each bonus which is why it is better to contact the support team to have this information. It might disappoint you that there are only three bonuses offered here. You will not find typical casino deals like cashbacks or reload bonuses. On a brighter note, you will enjoy the Reel Races especially if you are a fan of video slots. You will find different game categories on Casumo. There are slot machines, table games, jackpots, and live casino. The betting site also has a section for Only at Casumo and Casumo Loves which consist of the site’s recommended games. If you are a big fan of video slots, you will appreciate that there are a lot of Bitcoins slots available here. You already have more than 800 high-quality titles for slots alone. These include popular titles such as Starburst, The Wild 3, and Immortal Romance. Navigate through the Table Games section, and you will see variations of roulette, blackjack, baccarat, and pontoon. You will also see other table games such as punto banco, pai gow, and poker. Playing against the dealer is also possible with the betting site’s Live Casino section. Here, you will find live versions of baccarat, roulette, and blackjack. There is also a Top Wheel Treasures if you are interested. 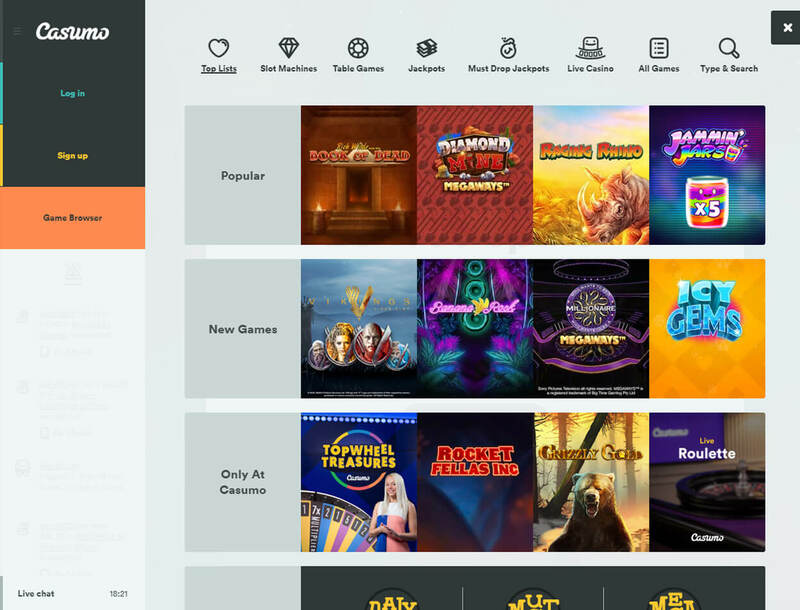 Although there is no sportsbook, poker room, or dice to complete the package, Casumo will win your heart with its huge game library that hosts top-notch games from leading game providers including Microgaming, NetEnt, and Play’n GO. The betting site will also continue capture your attention with its multiple payment channels. You can pay using Visa, Skrill, and paysafecard, to name a few. Payments can be done through mobile as well. The gaming portal accepts funds in CAD, EUR, and GBP. 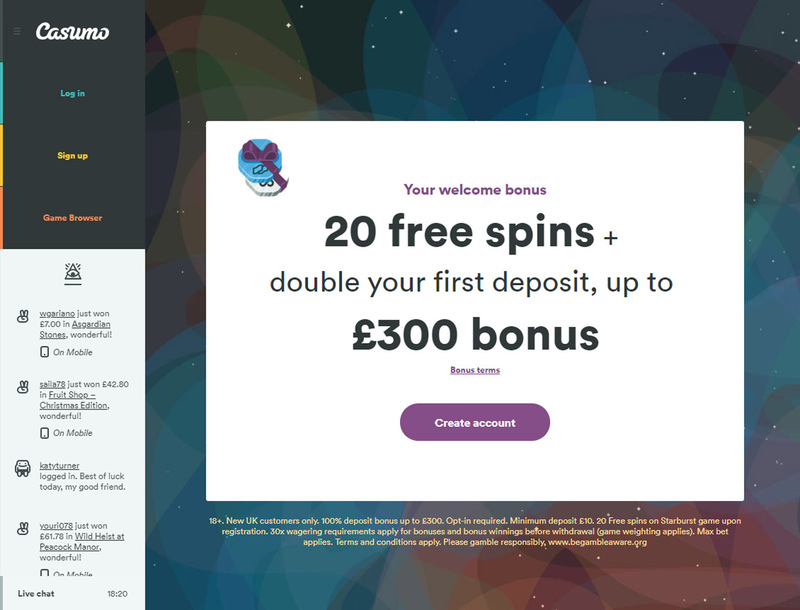 As a new member of the betting site, Casumo will assign you a minimum and maximum deposit although the standard minimum amount is £10. Over time, you can adjust this along with your loss limit, wager limit, logged in time limit, and so on. There is also a quick-deposit feature that allows you to make a fast deposit while you are still playing. Take note that this feature is applicable if you top up your account using Visa or Skrill. In terms of withdrawals, the gaming site allows you to cash out anytime you wish to. As much as possible, the casino requires you to use the same withdrawal method that you have used when you topped up your account. In the event that you are cashing out an amount more than £1,000, the betting site has the right to have additional verification procedures. With this, you may be required to provide your passport, national identity card, and copies of your utility bills. Casumo takes pride in its huge game library. Not only will you find popular games here, but also a wide variety of titles. The Slot section alone has more than 800 games that will keep you playing for hours. Payments will not be a problem as the casino offers a quick-deposit feature that will let you make a deposit without requiring you to leave the game. Speaking of payments, the gaming hub accepts several deposit and withdrawal methods. You can even pay using your mobile device if you want to. It also lets you set your deposit limit to make sure that you are still in control of your funds. The downside of this site is that it has few bonuses. You can get free spins and deposit bonuses only. On a brighter note, the Reels Race can give you free spins every 30 minutes, giving you more chances to play your favorite slot. In conclusion, Casumo can be considered as one of the great betting sites in the industry. With its rewarding and exciting offers, you will not have second thoughts in joining this casino.